The Bible Of Mysteries: What Is Hell & Her Punishments? What Is Hell & Her Punishments? In many religious traditions, Hell is a place of suffering and punishment in the afterlife. Religions with a linear divine history often depict Hell as endless. Religions with a cyclic history often depict Hell as an intermediary period between incarnations. Typically these traditions located Hell under the external core of the Earth's surface and often included entrances to Hell from the land of the living. Other afterlife destinations included Heaven, Purgatory, Paradise, Nirvana, Naraka, and Limbo. Other traditions, which did not conceive of the afterlife as a place of punishment or reward, merely described it as an abode of the dead — a neutral place located under the surface of Earth (for example, see sheol and Hades). Modern understandings of Hell often depict it abstractly, as a state of loss rather than as fiery torture literally underground, but this view of hell can, in fact, be traced back into the ancient and medieval periods as well. Hell is often portrayed as populated with daemons, who torment the damned. Many are ruled by a death god, such as Nergal, Hades, Yama or the Christian/Islamic Devil, called Satan or Lucifer. Punishment in Hell typically corresponds to sins committed during life. Sometimes these distinctions are specific, with damned souls suffering for each sin committed (see for example Plato's myth of Er or Dante's The Divine Comedy), and sometimes they are general, with sinners being relegated to one or more chamber of Hell or level of suffering. In many religious cultures, including Christianity and Islam, Hell is traditionally depicted as fiery and painful, inflicting guilt and suffering. Despite theses common depictions of Hell as a place of fire, some other traditions also portray Hell as cold. In Buddhist, and particularly in Tibetan Buddhist, descriptions of hell, there are an equal number of hot and cold hells. 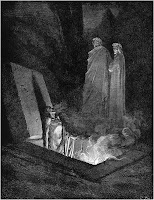 Among Christian descriptions Dante's Inferno portrays the innermost (9th) circle of Hell as a frozen lake of blood and guilt, But cold also played a part in earlier Christian depictions of hell beginning with the “Apocalypse of Paul,” originally from the early third century; “The Vision of Drythelm” by the Venerable Bede from the seventh century; “St Patrick's Purgatory,” The Vision of Tundale” or “Visio Tnugdali” and the “Vision of the Monk of Enysham” all from the twelfth century; and the “Vision of Thurkill” from the early thirteenth century. Escape In Protestantism, beginning with Martin Luther, the grace of God played the primary role in determining a soul's afterlife destiny, whereas Catholicism has always believed in the efficacy of good works. The conflict between these two positions was one of the moving forces behind the Protestant Reformation, which particularly rejected the selling of indulgences and as well as other forms of popular piety. Hinduism, Buddhism and Islam advocate the efficacy of good works in avoiding the punishment of hell. With the rise of the cult of Osiris during the Middle Kingdom the “democratization of religion” offered to even his humblest followers the prospect of eternal life, with moral fitness becoming the dominant factor in determining a persons suitability. At death a person faced judgment by a tribunal of forty-two divine judges. If they led a life in conformance with the precepts of the Goddess Maat, who represented truth and right living, the person was welcomed into the Two Fields. If found guilty the person was thrown to a “devourer” and didn't share in eternal life. The person who is taken by the devourer is subject first to terrifying punishment and then annihilated. These depictions of punishment may have influenced medieval perceptions of the inferno in hell via early Christian and Coptic texts. Purification for those who are considered justified may be found in the descriptions of “Flame Island”, where they experience the triumph over evil and rebirth. For the dammed complete destruction into a state of non being awaits but there is no suggestion of eternal torture; the weighing of the heart in Egyptian Mythology can lead to annihilation. Divine pardon at judgement was always a central concern for the Ancient Egyptians. Our undertsanding of Egyptian notions of hell are based on six ancient texts: The Book of Two Ways (Book of the Ways of Rosetau), The Book of Amduat (Book of the Hidden Room, Book of That Which Is in the Underworld), The Book of Gates, The Book of the Dead (Book of Going Forth by Day), The Book of the Earth and The Book of Caverns. In classic Greek mythology, below Heaven, Earth, and Pontus is Tartarus, or Tartaros (Greek Τάρταρος, deep place). It is either a deep, gloomy place, a pit or abyss used as a dungeon of torment and suffering that resides within Hades (the entire underworld) with Tartarus being the hellish component. 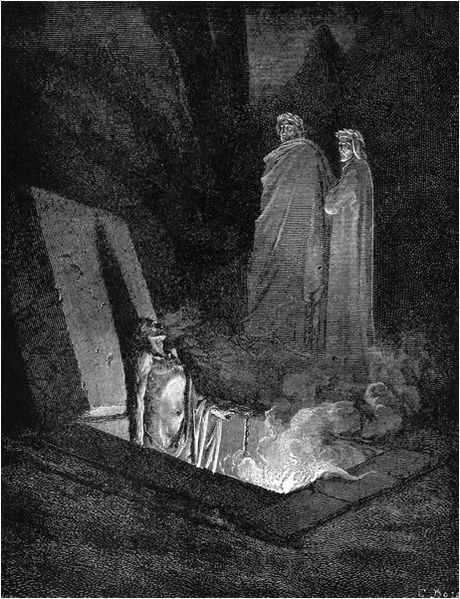 In the Gorgias, Plato (c. 400 BC) wrote that souls were judged after death and those who received punishment were sent to Tartarus. As a place of punishment, it can be considered a hell. The classic Hades, on the other hand, is more similar to Old Testament Sheol. The hells of Europe include Breton Mythology's “Anaon”, Celtic Mythology's “Uffern”, Slavic mythology's "Peklo", the hell of Lapps Mythology and Ugarian Mythology's “Manala” that leads to annihilation. The hells of Asia include Bagobo Mythology's “Gimokodan” and Ancient Indian Mythology's “Kalichi". African hells include Haida Mythology's “Hetgwauge” and the hell of Swahili Mythology. The Oceanic hells include Samoan Mythology's “O le nu'u-o-nonoa” and the hells of Bangka Mythology and Caroline Islands Mythology. The hells of the Americas include Aztec Mythology's “Mictlan”, Inuit mythology's “Adlivun” and Yanomamo Mythology's “Shobari Waka”. In Maya mythology , Xibalbá is the dangerous underworld of nine levels ruled by the demons Vucub Caquix and Hun Came. The road into and out of it is said to be steep, thorny and very forbidding. Metnal is the lowest and most horrible of the nine Hells of the underworld, ruled by Ah Puch. Ritual healers would intone healing prayers banishing diseases to Metnal. Much of the Popol Vuh describes the adventures of the Maya Hero Twins in their cunning struggle with the evil lords of Xibalbá. The Aztecs believed that the dead traveled to Mictlan, a neutral place found far to the north. There was also a legend of a place of white flowers, which was always dark, and was home to the gods of death, particularly Mictlantecutli and his spouse Mictlantecihuatl, which means literally "lords of Mictlan". The journey to Mictlan took four years, and the travelers had to overcome difficult tests, such as passing a mountain range where the mountains crashed into each other, a field where the wind carried flesh-scraping knives, and a river of blood with fearsome jaguars. Muslims believe in jahannam (in Arabic: جهنم) (which is related to the Hebrew word gehinnom and resembles the versions of Hell in Christianity). In the Qur'an, the holy book of Islam, there are literal descriptions of the condemned in a fiery Hell, as contrasted to the garden-like Paradise (jannah) enjoyed by righteous believers. In addition, Heaven and Hell are split into many different levels depending on the actions perpetrated in life, where punishment is given depending on the level of evil done in life, and good is separated into other levels depending on how well one followed God while alive. The gate of Hell is guarded by Maalik who is the leader of the angels assigned as the guards of hell also known as Zabaaniyah. The Quran states that the fuel of Hellfire is rocks/stones (idols) and human beings. Although generally Hell is often portrayed as a hot steaming and tormenting place for sinners, there is one Hell pit which is characterized differently from the other Hell in Islamic tradition. Zamhareer is seen as the coldest and the most freezing Hell of all; yet its coldness is not seen as a pleasure or a relief to the sinners who committed crimes against God. The state of the Hell of Zamhareer is a suffering of extreme coldness, of blizzards, ice, and snow which no one on this earth can bear. The lowest pit of all existing Hells is the Hawiyah which is meant for the hypocrites and two-faced people who claimed to believe in Allah and His messenger by the tongue but denounced both in their hearts. Hypocrisy is considered to be one of the most dangerous sins, and so is Shirk. The Bahá'í Faith regards the conventional description of Hell (and heaven) as a specific place as symbolic. Instead the Bahá'í writings describe Hell as a "spiritual condition" where remoteness from God is defined as Hell; conversely heaven is seen as a state of closeness to God. In "Devaduta Sutta" the 130 th discource of Majjhima Nikaya Buddha teaches about the hell in vivid detail. Buddhism teaches that there are five (sometimes six) realms of rebirth, which can then be further subdivided into degrees of agony or pleasure. Of these realms, the hell realms, or Naraka, is the lowest realm of rebirth. Of the hell realms, the worst is Avīci or "endless suffering". The Buddha's disciple, Devadatta, who tried to kill the Buddha on three occasions, as well as create a schism in the monastic order, is said to have been reborn in the Avici Hell. However, like all realms of rebirth, rebirth in the Hell realms is not permanent, though suffering can persist for eons before being reborn again. In the Lotus Sutra, the Buddha teaches that eventually even Devadatta will become a Pratyekabuddha himself, emphasizing the temporary nature of the Hell realms. Thus, Buddhism teaches to escape the endless migration of rebirths (both positive and negative) through the attainment of Nirvana. The Bodhisattva Ksitigarbha, according to the Ksitigarbha Sutra, made a great vow as a young girl to not reach Enlightenment until all beings were liberated from the Hell Realms or other unwholesome rebirths. In popular literature, Ksitigarbha travels to the Hell realms to teach and relieve beings of their suffering. Early Vedic religion doesn't have a concept of Hell. Ṛg-veda mentions three realms, bhūr (the earth), svar (the sky) and bhuvas or antarikṣa (the middle area, i.e. air or atmosphere)). In later Hindu literature, especially the law books and Puranas, more realms are mentioned, including a realm similar to Hell, called naraka (in Devanāgarī: नरक). Yama as first born human (together with his twin sister Yamī) in virtue of precedence becomes ruler of men and a judge on their departure. Originally he resides in Heaven, but later, especially medieval traditions, mention his court in naraka. In the law-books (smṛtis and dharma-sūtras, like the Manu-smṛti) naraka is a place of punishment for sins. It is a lower spiritual plane (called naraka-loka) where the spirit is judged, or partial fruits of karma affected in a next life. In Mahabharata there is a mention of the Pandavas going to Heaven and the Kauravas going to Hell. However for the small number of sins which they did commit in their lives, the Pandavas had to undergo hell for a short time. Hells are also described in various Puranas and other scriptures. Garuda Purana gives a detailed account of Hell, its features and enlists amount of punishment for most of the crimes like a modern day penal code. It is believed that people who commit sins go to Hell and have to go through punishments in accordance with the sins they committed. The god Yamarāja, who is also the god of death, presides over Hell. Detailed accounts of all the sins committed by an individual are kept by Chitragupta, who is the record keeper in Yama's court. Chitragupta reads out the sins committed and Yama orders appropriate punishments to be given to individuals. These punishments include dipping in boiling oil, burning in fire, torture using various weapons, etc. in various Hells. Individuals who finish their quota of the punishments are reborn in accordance with their balance of karma. All created beings are imperfect and thus have at least one sin to their record; but if one has generally led a pious life, one ascends to svarga, a temporary realm of enjoinment similar to Paradise, after a brief period of expiation in Hell and before the next reincarnation according to the law of karma. 0 Response for the "What Is Hell & Her Punishments?"